What do Cheetahs Eat in the Wild and How Much do Cheetahs Eat? Cheetahs love to eat gazelles, which are also known for their speed. 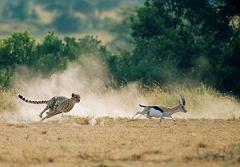 Cheetahs usually watch for gazelles that has strayed from the herd. The cheetah then tries to sneak within 50 yards of its prey before attacking, since a cheetah can go its top speed for only about 300 yards. If the gazelle manages to escape capture for that distance, and most do, the cheetah gives up and skulks off to try again. When desperate, cheetahs will also occasionally eat impalas, birds, rabbits, and the babies of animals like the warthog, kudu, sable, and oryx. They not only catch food fast, they eat it as fast as they can as well. That’s because they’re not that good at self-defense, if challenged for their food by lions, hyenas, jackals, or other opportunists, the cheetahs will most often lose. Why are Cheetahs an Endangered Species and How Many Cheetahs are Left in the Wild? How do Cheetahs Communicate and What Kind of Sounds Do Cheetahs Make? Who were the Wild Rice People and How did Native Americans harvest wild rice?